Welcome to Corys Motorcycle Sales and Salvage! 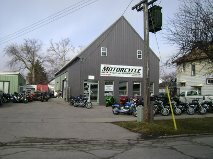 We are a motorcycle dealer operating in Sarnia, Ontario, Canada. We offer a huge selection of pre-owned motorcycles. Our collection of used and new parts is matched by no one. If you need it we probably have it in stock. We specialize in newer model sport bikes. If you live in the area stop by our showroom at 433 Palmerston St. S. off Campbell St. near the Via train station. We have in stock a wide selection of helmets, jackets and accessories. We are committed to providing you with the highest quality products and services at an affordable price. Come to us and we will help you find your next motorcycle. © 2017. Corys Motorcycle Sales and Salvage. All Rights Reserved.